What most people want when they say, “I need PR” is what is known as earned media coverage. This is where you, your product or organization is a source for a broadcast segment or print article, not a subject of advertising (aka commercials). Tidbits and tips show the media how you can educate or entertain their audience best. It adds just the right type of sparkle. Think of it as added value for the media. Then, they can figure out how you and your tips & tidbits fit inside the story they’re writing and producing for their bosses (and audiences). How can you add a bonus to what you’re offering the media? Ask yourself that while you watch how our server presented lunch to us and then write to me and let me know what you’re doing. If you have questions about how to add sparkle to your PR campaign, let me know with what area you struggle so I can help you. 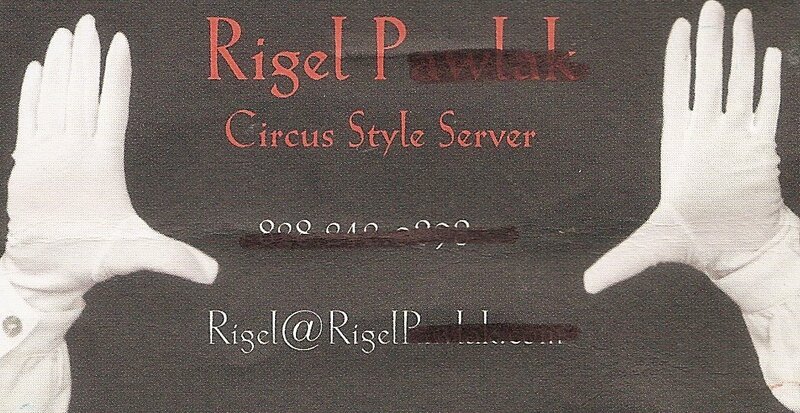 I want to also add, the server gave me his business card that clearly indicated he was a circus style server so that I could send him a link from my Internet posting. Circus style server. Brilliant branding! He didn’t know I was a publicist. He sure is brilliant on how to network, though. When you contact the media, always make sure they know how to contact you back, especially after hours. I can’t tell you how many media people have told me over the past two decades how many times they’re pitched with no phone number or follow-up information. Don’t be the clown at your own PR circus. Instead, be the PR Ringmaster and wow the media with entertainment, education and most importantly, how you can be contacted. You are currently browsing the Michelle Tennant Nicholson blog archives for October, 2011.